Thirty years ago today I was but a few weeks into my senior year of college. 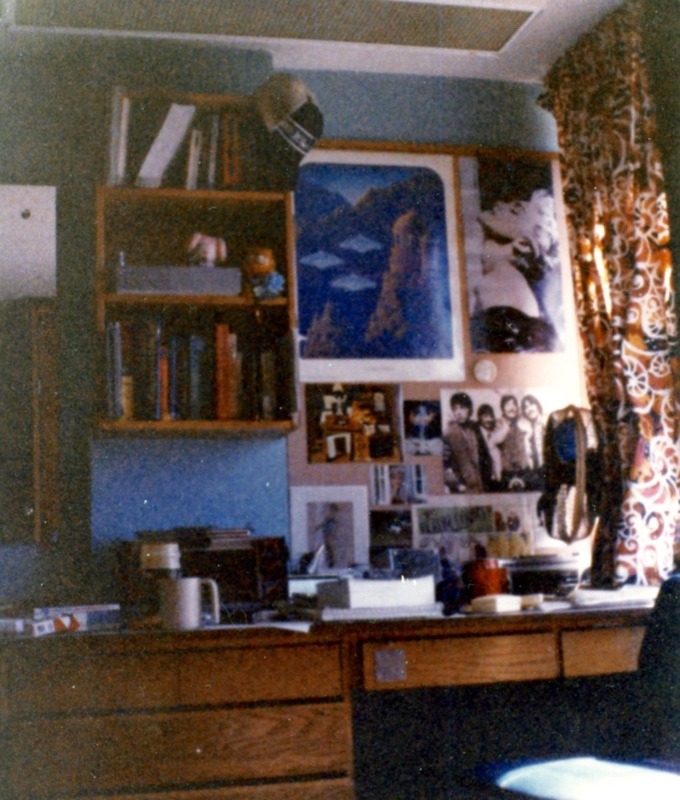 The picture to the left is of my desk in my dorm room, and it tells much about me then – a print of the Gilbert Williams painting “Celestial Visitation,” which is probably known to most as the cover of Crosby, Stills & Nash’s 1982 Daylight Again album; beside it, the fold-out poster that came with Madonna’s True Blue LP; my Ballad of Sally Rose button, which I purchased the previous year when I saw Emmylou Harris in concert, is beneath it; and, beneath that, a picture of the Beatles, circa 1967, that was taken by Linda Eastman (though I didn’t know it at the time). To the left of that: a postcard from the Wings Fun Club that looked cool to me; and, beneath that, a Marilyn Monroe postcard. I can’t make out the rest, but suffice it to say that I had one foot in the past, another in the present, and an ear for hip country sounds. According to the Weather Underground, September 5th, 1986, was a rainy day in State College, home of the Penn State mothership, with a high of 75 degrees and a low of 55. Hot movies that summer included She’s Gotta Have It, Stand by Me and The Fly; and Shanghai Surprise, which starred Madonna and Sean Penn, had cratered at the box office the previous weekend. In America at large, the economy was still in the midst of rebounding from the nasty recession of 1981-82; the unemployment rate at the start and end of the month clocked in at seven percent – not a great number, but much better than the double-digit rates of late 1982 and early ’83 – and inflation, at all of 1.8 percent, was a non-factor. The state of my personal economy was fairly good, too: I had a summer’s worth of savings thanks to full-time shifts at a department store back home. I continued selling my plasma twice a week like clockwork, most weeks, and rented out my student pass for Nittany Lion home games; while I attended every tailgate, I actually only saw one game during my two years at main campus. (And no regrets about that, either.) My expenses consisted primarily of fast-food, alcohol and cigarettes. – but the year was far more than that sad day. 2) The Bangles – Different Light. Selected track: “If She Knew What She Wants.” Yeah, some folks may not rank this album quite as high as me, but – I loved it then, and I love it now. Back when it was released, in early ’86, much of my music purchases was on cassette – they took up less room and, too, I had a cassette deck in my car. I actually played my original tape so much that you could hear the music on the flip side bleeding through. A quick side-note: Those top two picks are easy enough for me to recall, as I noted them at the time; and have kept them on one list or another every year since. Numbers 3 on – I’m guesstimating to an extent, as they’re albums that I loved then and still enjoy today. Where, exactly, they fall…that’s up for (internal) debate. 3) Dwight Yoakam – Guitars, Cadillacs, Etc., Etc. Selected track: “Honky Tonk Man,” the lead single to Dwight’s debut album, is a remake of a classic Johnny Horton song. It’s just plain intoxicating; and, at the time, it sent out a signal that Yoakam was pursuing a more purist sound than the era’s Urban Cowboy-flavored norm. 4) Steve Earle – Guitar Town. Selected track: “Guitar Town.” Another country-music outsider, another great debut. It was considered too country for rock audiences and too rock for country folk, but it found its niche with those of us who liked both. 5) Belinda Carlisle – Belinda. Selected track: “Mad About You.” The former (and future) lead singer of the Go-Go’s released her solo debut during the early summer, and it’s a gem. As with the four preceding entries, it’s an album I still listen to on a regular basis. And here’s some trivia: Andy Taylor (of Duran Duran) plays the guitar solo on this song; and the album also features former Wings guitarist Laurence Juber and non-Rolling Stone Nicky Hopkins in addition to fellow Go-Go Charlotte Caffey, who wrote one of the songs and co-wrote four others. 7) Madonna – True Blue. Selected track: “Papa Don’t Preach.” Yeah, yeah, some people will undoubtedly smirk upon seeing Madonna’s name in this list, but I have no shame. I loved it then, as evidenced by the poster above my dorm-room desk, and still find it enjoyable today. It was also the last of her albums that I liked from start-to-finish. 8) Van Morrison – No Guru, No Method, No Teacher. Selected track: “In the Garden.” One of my favorite Van albums, and one of his all-time best. Words really don’t do it justice. 10) Lone Justice – Shelter. Selected track: “Wheels.” Lone Justice Mach II wasn’t on a par with the original lineup, and this sophomore set wasn’t as strong as the original lineup’s 1985 debut. Yet, even with that, it contains some of Maria McKee’s greatest songs, including “I Found Love,” the title cut, “Dixie Storms” and this. Thanks for the shout-out, my man. In the immortal words of Chuck D, “You’re Gonna Get Yours” and I mean that in the most non-menacing way possible. Love the collage there above the desk. Dwight has been featured twice on my blog and I owe him another chapter though he will be making a cameo in this Wednesday’s post. I’m looking forward to his new album, wherein he covers his own songs in a straight-up bluegrass style. He’s also doing Prince’s “Purple Rain” and it’s going to be one of those rare times when two of my favorite artists collide. Didn’t Susanna Hoffs sing backup on Belinda Carlisle’s solo album?